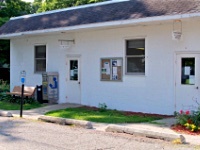 The Branch District Library provides outreach services to deliver library materials to those who, for a variety of reasons, cannot take advantage of them in person. This service will provide free delivery of materials to those who are physically unable to visit the library, including the elderly, the disabled, and those who are temporarily incapacitated by illness or accident. The Library will coordinate with existing service providers, including nursing home and institutional staff to deliver materials to senior citizens and disabled individuals in an effort to provide a similar level of access to the materials provided to all other Branch County residents. The only requirement to use this service is a valid Branch District Library card. Materials will be checked out to either the institution or individual and overdue fines will be waived for material borrowed through this service. Once registered for this service, you may request specific items or simply describe your interests and materials will be selected for you. Materials will be provided to meet both leisure and informational needs. Available items include regular print books, large print books, books on tape or CD and videos or DVDs of both feature films and non-fiction subjects. Reference and non-circulating materials are not included in this service, but a limited number of photocopies will be made available to answer reference questions. To register for this service, please call the Coldwater branch at (517) 278-2341.